Teaching kids about nature is important, right? No arguing about that. Children today lack the connection with nature, its flora and fauna, so it’s important that we give them this opportunity. They are our hope that the future generations will have a different approach to the planet we live in and it’s up to us to plant in their hearts the seed of love and respect for nature. There are plenty of joyful ways to do so. 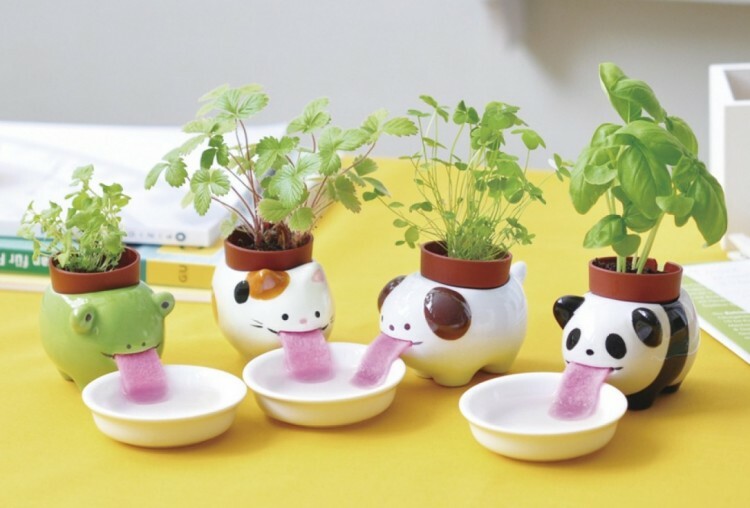 This is why we found these cute planters to be so awesome. They not only are lovely gift and piece of decor for your child’s bedroom, but also a playful tool to help you teach them about nature. What’s more fun and cool is that the water goes in the tray and gets to the seed through the tongue (the secret is that is made of felt). They come in four styles and different seeds, which you can choose and have your kid water them and watch them grow. They can observe the life cycle of the plant, and how important it is that we take care of them. One great idea is to have kids make a record of their observation and share them with friends. The planters are made by a Japanese company called Noted and they cost €15 ( about US$17). You can buy them at Collete. Let us be reminded that we are can always be children in our hearts, so we also think these cuties are a great gift for a valentine, a friend or for ourselves (we think they’re a must-have). So, whether you get them for your children or anyone you cherish, they are a drop of love and joy in their hearts.